DC cinematic universe has been a mess ever since its inception. Every trick they tried to get the DCEU to work failed because they were trying to emulate the MCU. Since they already had such big head-start, there was no way that they were going to really catch up. The only other way they could really succeed would be to let their directors bring their own style into it. Take their successes, for example, Aqua man and Wonder-woman. Both of these films have vastly different in the way they feel and look. Hence, it was a great choice to let the director dictate the style of the film and not really worry about the continuity or expansion of lore. 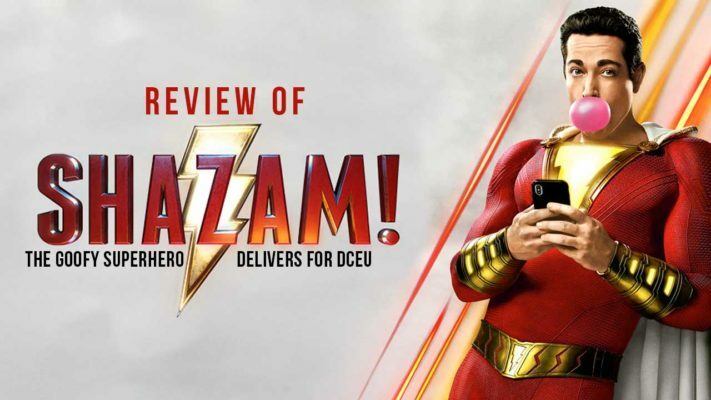 Shazam follows a 14-year-old foster kid Billy Batts, trying to find his long-lost mother. When he is on the run from some kids, he ends up being transported to a magical wizard’s lair, where he is asked to take his mantle. If he chooses to accept it, he needs to protect the world from the seven deadly sins who have escaped with an evil genius called Thaddeus. It is basically what happens when you imagine the Tom Hanks classic BIG, like a superhero movie. The one thing that I really admired about the film was that it was never afraid to be silly. The movie reminded me of the movies of my childhood like Goonies or ET or Home Alone. These films had a way of capturing this kind of reckless abandon that kids feel at that age. Billy is surrounded by a group of diverse and endearing foster siblings that put a smile on your face every time they appear on the screen. Especially the always hugging Darla and his always quippy side-kick Freddy Freedman. The film balances the stakes with the right amount of whimsy to transport you right into your childhood living room watching your favourite films. David F Samberg is a recent success story that is taking over Hollywood. He has previously worked on short films, and got his big break from the short film, Lights Out. The short film became such a huge hit, that he got a chance to turn it into a feature. He later went on to make Annabelle: Creation, one of the rare good Conjuring spin-offs. Finally, with this film, we are seeing the rise of a new voice in great genre cinema. He has this way of infusing the movie with the right amount of post-modern self-awareness and genuine emotional weight. I still remember the scene where Billy Batts meets his mother, which almost brought me to tears while watching it. Finally, the greatest strength of the movie is the casting. Going in the order of importance. Zachary Levi who plays Shazam when he is the superhero plays the character in a very tongue-in-cheek way making him very endearing. He perfectly balances out the child-like wonder with a teenager’s angst hidden inside. He even gets small ticks of the actor playing his younger version (Asher Angel), to make the outlandish plot seem organic. His side-kick and foster brother Freddy Freedman, played by Jack Dylan Grazer brings in the heart that is needed for Billy to grow into his responsibility. Mark Strong, as usual, is just perfect as Thaddeus. The rest of the actors that round out the cast make their performances seem irreplaceable. Overall, the movie is a home run for the DCEU. I hope they continue to bring in good film-makers and allow them the freedom to bring their vision to life. If you are looking for something that is fun, but at the same time a very well-done film, go watch Shazam! [VoxSpace Tech] Stadia: Can Google’s New Gaming Platform Dethrone The Xbox And PlayStation?